iPod owners may face the needs to transfer their iPod files to PC, for iTunes doesn't provide this feature at all. Using Tipard iPod to PC Transfer, you would never worry about the files-losing problem. 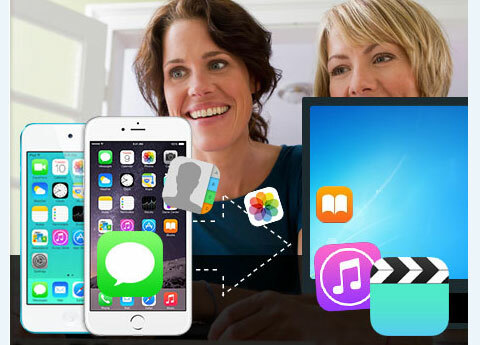 This iPod to PC Transfer can help you copy music/movie/TV Shows/Podcast/iTunes U/eBooks/Pictures/Voice memos/Camera shot from iPod to PC without losing anything. Also, the Backup Function can help you easily backup all SMS, Contacts as database files to PC for safety. 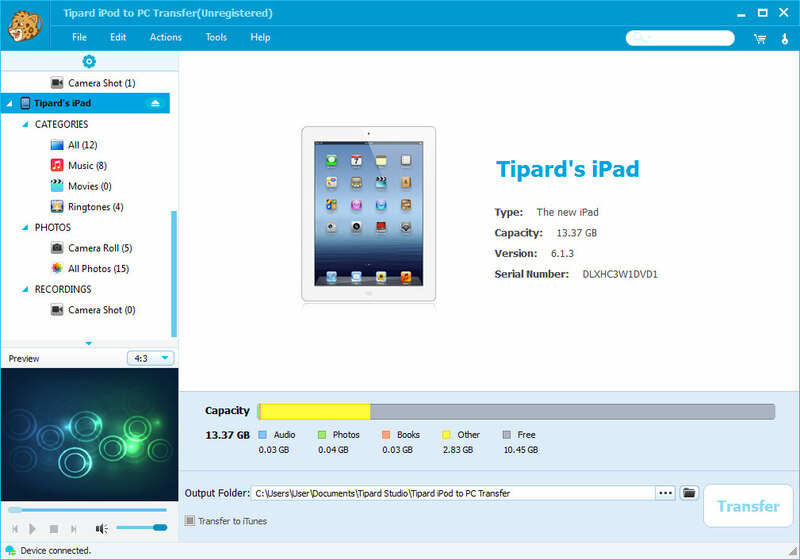 In addition, this Tipard iPod to PC Transfer has powerful compatibility, which supports all iPod, iPad and iPhone versions, including all iPod models(such as iPod nano 6, iPod touch 4), and all iPad & iPhone versions(such as iPhone XS/XS Max, iPhone XR, iPhone X/8/8 Plus). Plus, it highly supports the newest iOS 12 and iTunes 12. Feel tempted? Just have a free trial, you can get many surprises beyond your imagination! This iPod to PC Transfer can guarantee transferring all iPod files to PC fast and steadily. 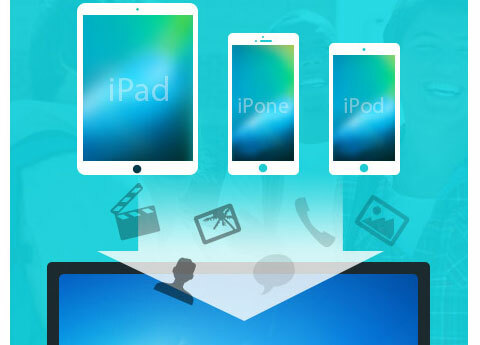 You can easily transfer all your iPod files from iPod to PC with simple operating steps and fast processing speed. This iPod to PC Transfer enables you to copy various iPod files including TV Shows/Podcast/iTunes U from iPod to iTunes, even the newest iTunes 12. This iPod Transferring software can instantly recognize your iPod or other Apple devices once which are connecting with PC, and show all device information, including type, capacity, version and serial number. Support iPod 1G, iPod 2G, iPod 3G, iPod 4G, iPod classic, iPod mini, iPod nano 1, iPod nano 2, iPod nano 3, iPod nano 4, iPod nano 5, iPod nano 6, iPod shuffle 1, iPod shuffle 2, iPod shuffle 3, iPod touch, iPod touch 2, iPod touch 4, iPod Video, iPod Firmware 3.0/3.1; iPad Wi-Fi, iPad Wi-Fi+3G, iPad 16GB, iPad 32GB, iPad 64GB; iPhone, iPhone 3G, iPhone 3GS, iPhone 4 and iPhone 4S. Tipard iPod to PC Transfer allows you to transfer many mainstream media files, including music/movie/TV Shows/Podcast/iTunes U/eBooks/Photos(Camera Roll)/Voice memos/Camera shot, etc. 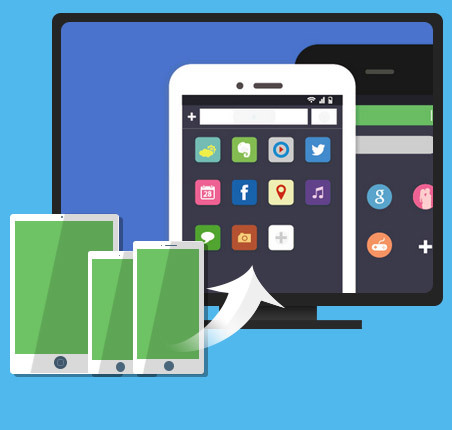 With this iPod Transferring application, you can backup all your iPhone/iPhone 4 SMS and Contacts as database files to your PC for safety. Also, you can delete unwanted SMS in the backup files at random. 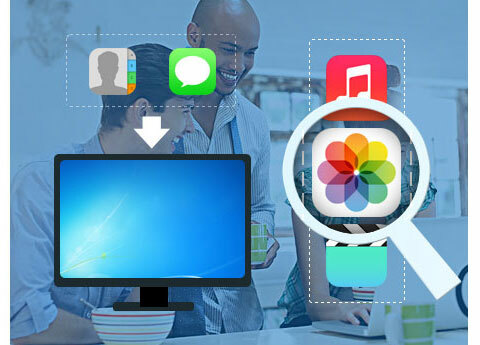 Photo Viewer and media previewing function can help you easily preview all music, movie, Podcast, iTunes U and other video/audio files. You can choose to sort the file by Artist, Album and Genres as you like. This function allows you to define what kind of iPod files should be shown or not, which makes iPod to PC Transfer more convenient and user-friendly. You can easily export various files by different types and put them in different output folders. iPod Transfer Pro to transfer files from iPod to PC and from PC to iPod. iPhone to PC Transfer to backup files from iPhone to PC.